Lyft is the latest brand trying to build market share by posing as a “progressive” corporation. But the fight can’t be good corporations against bad ones — it's working people against capitalism. 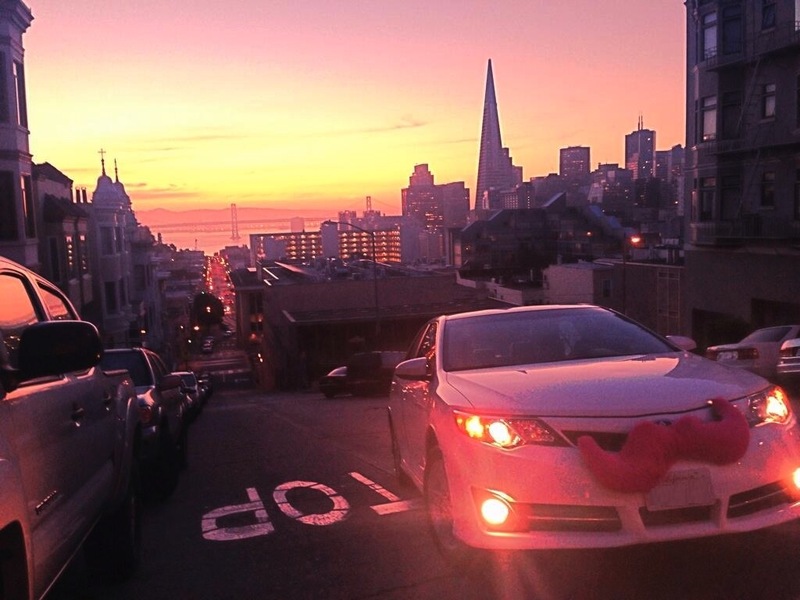 Lyft’s pink car mustache. Pkg203 / Wikimedia Commons. In early 2017, liberals hit on a new strategy to resist the nascent Trump administration: #DeleteUber. It started when New York City’s taxi drivers refused to service JFK airport to protest Trump’s travel ban targeting Muslim-majority countries, and Uber was spotted leveraging the ensuing crisis for profit. Then Uber CEO Travis Kalanick came under fire for accepting an appointment to Trump’s economic advisory council. He announced his resignation from the council, but only weeks later a video leaked of Kalanick reprimanding a driver for his company. Amid various ensuing scandals, Kalanick stepped down as CEO of Uber, but by then millions of consumers had turned on the brand in protest, deleting the Uber app from their phone and opting instead for the rideshare giant’s rival Lyft. What socialists understand that liberals don’t is that brands are corporate enterprises, and corporate enterprises are fundamentally motivated by the pursuit of profit — even in their ostentatious acts of charity and wokeness. Three surefire ways to maximize profit are: suppressing labor costs by paying workers as little as you can get away with, lobbying the state for deregulation and lower taxes, and opening new markets by finding new things to commodify and sell. Businesses will always pursue these avenues of profit maximization where they can. It’s not a matter of ethics but of market discipline: if they don’t, they run the risk of losing out to the competition and eventually capsizing. Sometimes corporations do things for publicity that make it seem like their interests are not fundamentally misaligned with those of the working-class majority, who rely on decent wages and well-funded public services. But those efforts are meant to sustain public confidence in a given corporation’s brand, which is occasionally necessary for keeping up profits, as Uber’s losses in 2017 demonstrate. When corporate profits come into direct conflict with active measures to improve people’s wellbeing, corporations will always select the former. Case in point: Lyft just donated $100k to the campaign against a ballot measure that would create a tax fund to house the homeless in San Francisco, where the company is based. Why did the progressive alternative to Uber do this? Well, because the company doesn’t want to pay higher taxes. Because high taxes imperil profits, and profits are the point. Another likely rationale is to build stronger bonds with pro-business advocacy groups in San Francisco, so that the company will have allies if the city decides to implement regulations against ride-sharing services, which is rumored to be a possibility. Lyft has already mastered the art of suppressing labor costs and opening new markets. Next on the wish list, low taxes and deregulation. It’s pretty formulaic when you get down to it. San Francisco is home to an estimated 7,500 homeless people. Proposition C would tap the large corporations that benefit from the city’s public infrastructure to double the city’s homelessness budget in an attempt to resolve the crisis. The corporations opposing Proposition C say that the move would imperil jobs. This is not an analysis, it’s a threat. What they’re saying is that if the city reaches too far into their pockets, they’ll take their business elsewhere, draining the region of jobs and revenue as punishment for government overreach. It’s a mobster’s insinuation: Nice economy, shame if something happened to it. Meanwhile thousands of people sleep in the streets, even though the money to shelter them is within the city’s borders. Of course, in every struggle over taxes and industry regulation there may be a few canny corporate outliers looking to ingratiate their brand to the public by bucking the trend. In the case of Proposition C, it’s Salesforce, whose CEO Marc Benioff has made a public display of support for the ballot measure. But before you rush to praise Benioff, consider that only two months ago he lauded Trump’s tax cuts for fueling “aggressive spending” and injecting life into the economy. You could spend your life as an engaged consumer hopping from brand to brand, as liberals often do, pledging allegiance to this one and protesting that one to the beat of the new cycle drum. You could delete Lyft from your phone the same way you did with Uber, and find another rideshare app that you deem more ethical, until that one inevitably disappoints you too. Or you could press pause, stop scrambling for some superior consumption choice to ease your conscience, and entertain the socialist notion that deep down all corporations are objectively the same. They all exist to maximize return on investment for the people who own them. They are all in competition with each other to plunder our commons most effectively, with the lowest overhead, which means compensating the least for employees’ work. And when the rubber meets the road, they will all prioritize private profits over the wellbeing of those who own no productive assets, which is the vast majority of the people on the planet. They will demonstrate these priorities on a case-by-case basis, and on a massive global scale so long as capitalism prevails. “We’re woke,” said Lyft CEO John Zimmerman at the height of the Uber scandal. It was horseshit — it always is. And until liberals stop believing than any brand can be truly “woke,” or can offer a genuine alternative to the predatory behavior they observe in other “unwoke” brands, they’ll be unable to mount a meaningful resistance to anything. Whether we want to ensure clean drinking water for the residents of Flint or to shelter the homeless of San Francisco, we have to draw clear battle lines that are up to the challenge. The fight can’t be good corporations against bad corporations. It has to be working people against capitalism.